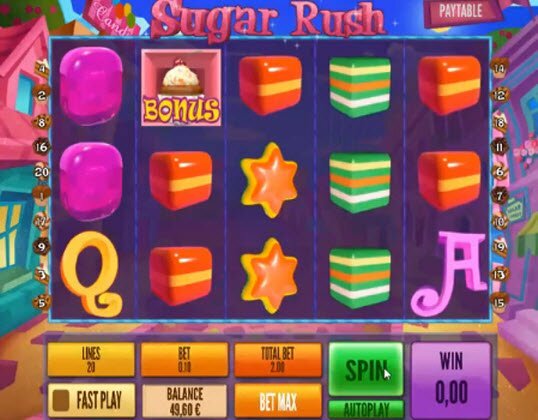 Satisfy your sweet tooth with TopGame software’s Sugar Rush Slot Machine. The graphics come in 3D quality accompanies by a cute, crystal clear soundtrack that sounds like someone is pouring candy. You’ll get a craving for sweet bonuses, and this game is sure to please. It contains not one, but two bonus games along with Wilds, Scatters, and more. 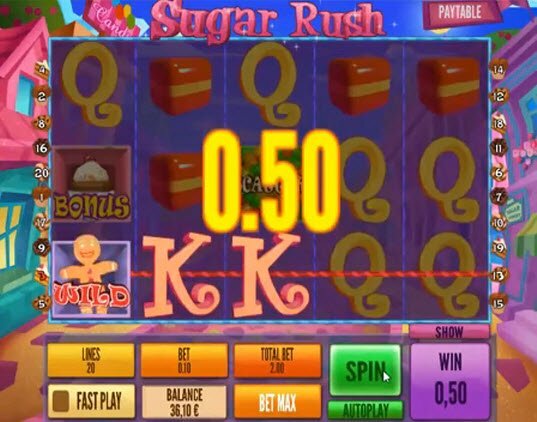 The Sugar Rush Slot will satisfy any sweet tooth with reels filled with all sorts of confections. The 3D graphics look delicious enough to eat and include colorful ginger bread man cookies, sweets, cupcakes, and swirling letters. As the reels spin, it sounds as though it’s raining candy, making this a sweet and exciting online game to play. 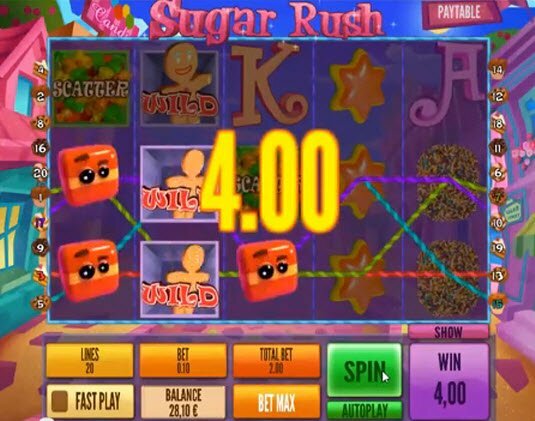 The Sugar Rush Slot comes full of bonus features including demo play, Wild Symbol, Scatter Symbol, Bonus Game, and Free Spins. The Sugar Rush Slot bonuses come full of features including demo play, Wild Symbol, Scatter Symbol, Bonus Game, and Free Spins. The Ginger Bread Man cookie serves as the Wild Symbol, substituting for all symbols. The video slot also awards a maximum coin jackpot of 9000. In addition, the game contains Fast Play, Bet Max, and Auto-play features to make playing as convenient as possible. The game contains two different Bonus Rounds. The first activates when three of more Cupcake Symbols appear on the reels. The player must then stack treats for prizes until two black treats appear. The second Bonus Game triggers when 5 Gummy Bear Scatters appear on the reels. This bonus awards up to 20 Free Spins for 5 Scatters, 15 Free Spins for 4 Scatters, and 10 Free Spins for 3 Scatters.